More often than not, where I choose to invest in my hair care is my styling products. These are the products that are applied after you get out of the shower and stay in your hair for more than a few minutes – any type of leave-in conditioners, de-frizzing products, smoothing, curl enhancing, volumizing, color-protecting, hydrating, straightening, etc. This is not to say that everything affordable from your local CVS is garbage, but I find that when I’m using a styling product in this category and spend a bit more on it, it just performs better. Personally, I cannot live without my It’s a 10 Miracle Leave-In Product. I’ve been using this for at least five years and I can tell a dramatic difference when I run out. It’s literally a 10-in-1 product that’s incredible for longer, knotty hair (like mine). I apply it to towel-dried/damp hair and it protects against heat damage, detangles, smooths and gives my hair a nice shine and bounce to it. I like the original, blonde or keratin versions. When I don’t want to heat style my hair at all, I love the new Bb Don’t Blow It. It’s a cream-gel formula that you apply to damp hair and simply let it air dry. You don’t even have to brush your hair after the shower – it gives a cool textured look. Usually, if I let my hair air dry without putting anything in it, it will dry like a wet rat – sort of frizzy, flat and dull looking. When I use Don’t Blow It after the shower before bed, it enhances any natural wave/texture, polishes the hair so it looks shinier and gives just a hint of body. I can use a couple of bobby pins in the morning and be on my merry way. It’s allowed me to more easily embrace my hair’s natural texture. With my hair being fairly thick, long and coarse, it always can use a bit of volume. Whether I use a curling wand or flat-iron, I always use some sort of texturizing spray and blast my roots with it – then rub the product against my roots for instant lift and messy texture. I absolutely adore drybar’s Triple Sec 3-in-1 because it adds texture and also is great for second and third day hair to refresh any style without having to re-wash and blow dry. I’ve used Oribe Dry Texturizing Spray and find they’re both equally as amazing and both smell delightful. Let’s make this easy… I save on the products that get rinsed down the drain. Some may think this is crazy because a good shampoo/conditioner is the foundation of good hair – and that may be true for those with more challenged locks – but since I have hair of steel, this is where I choose to save. I don’t know how much a $20-40 shampoo can really do compared to a $5 one, and I’ve tried so many. I’ve tried Oribe, Alterna, Redken, R+Co, Kerastase, Living Proof, Bumble and Bumble and more that I can’t even remember. Yes, some did seem to feel slightly better, but nothing like their styling product counterparts and nothing long-lasting. Oh, and hairspray. Hairsprays are amazing at the drugstore. I am constantly switching up my drugstore shampoo and conditioners, so just because Pantene is in these post photos, does not mean this is my hair staple. I use this duo (shampoo, conditioner) once a month when I want to clarify my hair of any product build up. It’s a great super-cleansing shampoo and nicely hydrating every day conditioner. I have never had any issues with Pantene. If and when my hair or scalp gets dry (usually if I’m under immense stress) and starts flaking, I immediately use this shampoo for a week and it takes care of the issue almost immediately. To keep my blonde bright and to help avoid any brassiness, I always keep a bottle in the shower of this shampoo or its generic version from Sally’s. I use it once a week. Some of my favorite conditioners from the drugstore are Herbal Essences Hello Hydration, Dove Daily Moisture or Intensive Repair, OGX Ever-Straight Brazilian Keratin Therapy Conditioner (nothing to do with straightening, lol), and L’Oreal Advanced Haircare Total Repair 5 Damage-Erasing Balm. All are moisturizing, but don’t weigh my hair down. I always have two types of hairspray in my collection – a soft, flexible hold and a super strong wont-knock-the-eiffel-tower-down hold. My go-to to hold any curl/waves is L’Oreal Elnett (fragrance free version is preferred, but I can handle the iconic ‘older’ scent of the original). I always get the Extra Strong Hold because it’s super flexible – as in, you can totally run your fingers through your hair and it never gets crunchy, yet still holds your style in place better than the regular hold. I use Elnett whenever I curl/wave my hair to help set the curls in place. When I need to keep my bangs from moving, I want to lock my waves in place, or hold the volume from the texture spray, I rely on this generic Kenra Volume Hairspray that I get at Sally’s Beauty Supply. The Kenra version runs $25+ for the same size bottle, but I pick this up for $8-9 and it’s identical – I’ve tried both. This hairspray is not easy to brush through, but will hold your style – it even tolerates a bit of misty rain like a boss. Both the Elnett and Volume Spray are MUST-HAVES for me, at all times. Lastly, my dry shampoo love goes to Batiste. 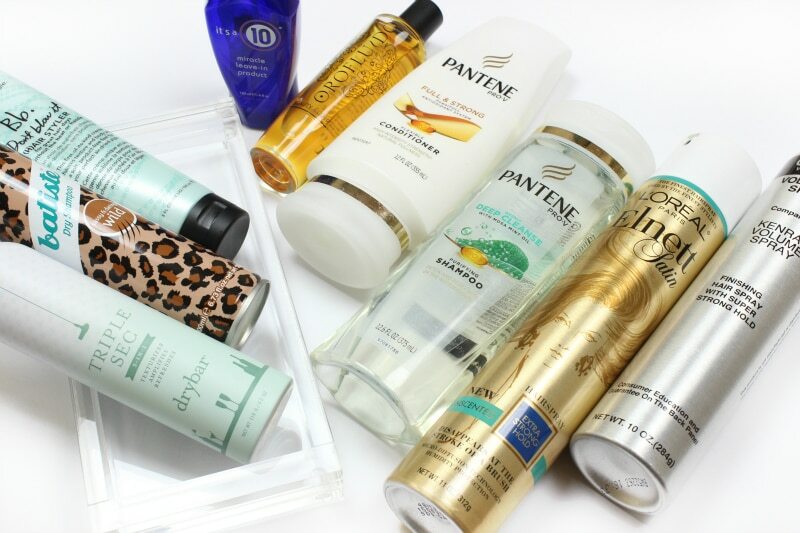 I’ve tried countless dry shampoos and while they all work to absorb oilies and add texture to the hair, every single one of them made my hair feel dirtier. Or they smelled yuck. Batiste is the only formula that seems to have rice as the main ingredient and that’s what I think gives my hair the light, fluffy and clean feeling this dry shampoo provides. I’ve used several of their different scents and all smell great – although my two favorites are the leopard bottle and the green/yellow/aqua. I hope this helps you streamline your hair care collection and/or give you some ideas on products to try. 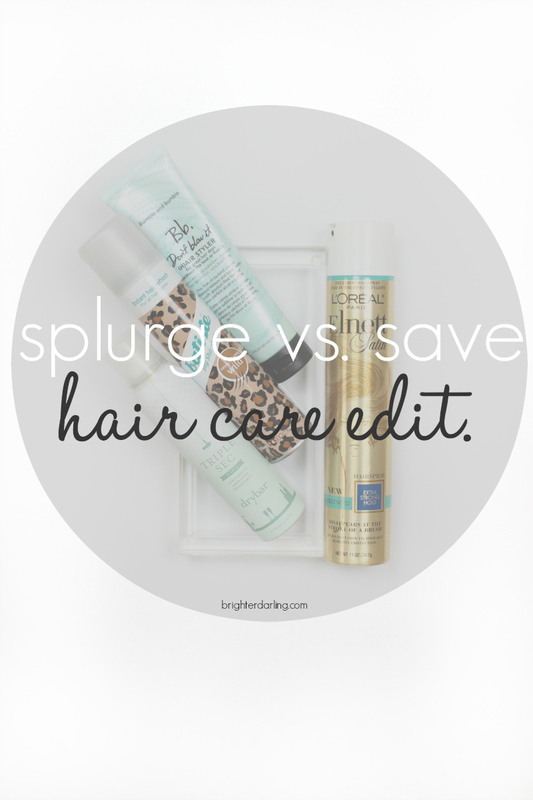 Looking for my makeup edit of this splurge vs save edit., click here. 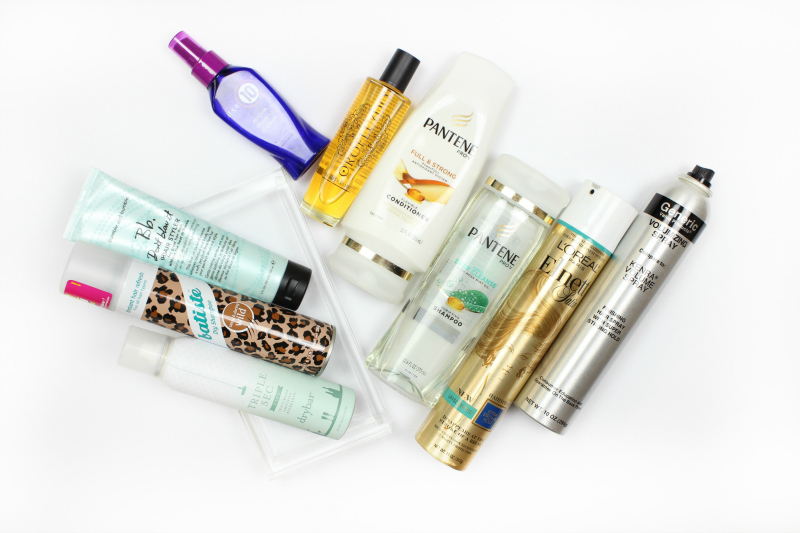 Comment below and let me know what some of your hair must-haves are – high end or drugstore! *I’d greatly appreciate your support in using any of my affiliate links throughout this post. I would not utilize affiliate links if I did not support the brand/product wholeheartedly. Read my full disclaimer here. "*NEW Product Review* | Marc Jacobs Velvet Noir Mascara"